if [HASHRATE IN MHASH] at the same rig appends .1 or one more than / less than that would not be lost in the statistics. Welcome, we are glad to cooperate. great choice in your pool name . Please note that this pool is in no way affiliated with ethpool.org! Of course, maybe you are rigth, but ethpool.pp.ua != ethpool.org . We will be rename later. great to see my open-sourced project used by others it's good for community and network. Good luck with pool. If you find any issues, feel free to contribute on github. Yes, You are absolutely right. Nice to hear it from the author, thank you for Your great work and desire to help the project. Already there are some changes in the code in my current implementation conditions, there were problems with speed of calculation on the validity of the shares and counting workers. All compounded by the fact that I'm not a programmer. But there is a bit of hashpower and the desire to build a pool. It is a pity that miners not be came. I think to avoid fee, but is unlikely to come. Anybody else cautious about a .exe miner extension for the pool? and repacked by WinRar for selfextracting to avoid problem with archivers. You can opening it by winrar and extracting miner or use standarting ethminer ver 0.9.41 . All files at archive was tested. I repacked it to ZIP. And what pool would that be? All payments already into the wallets, even with some bonus) for the inconvenience. Thank you for your understanding and that you are with us. We are making the pool for myself and good people. I will only do good in mining if I have at least an 2g GPU right? As You can see people mining at same hashrate as you are. The stats is open. If cards give a right solutions of shares - you will get the your piece of block. Аny comments are welcome and welcome to miners. X 00:06:09|main Failed to submit hashrate. X 00:06:12|main Failed to submit hashrate. 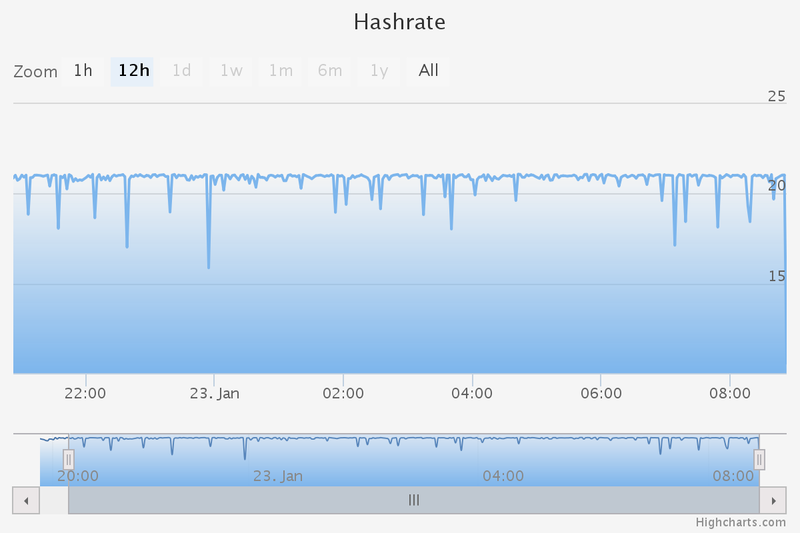 X 00:06:14|main Failed to submit hashrate. Please use right value as shown at help. Added the support of EtherProxy and started alfa testing it at our mining pool eth.pp.ua . We are glad to announce that the alpha testing stage of EtherProxy have passed successfully. Go to the beta stage. Thank to the author of EtherProxy for his work. Wishes and comments is welcomed. Does this support mining through port 80? because 80 port has a dynamic miner_difficulty and proxy will have rejects. While the miner_difficulty is static (1000000000) at the port 8888.
our patched version (the author is not quite correct sends submitHashrate). ✘ 23:39:08.963|ethminer Failed to submit hashrate. The reason: "Failed to submit hashrate." and do not use the option --disable-submit-hashrate. How do we integrate this into ethminer openCL? run a proxy and connect ethminer to http://local_ip:8546 of Ether-proxy. 1. How does the proxy work? 2. Do you need 1 proxy per rig or can you have multi rigs connected to 1 proxy? 3. if you only need 1 Proxy for multiple rigs how do you configure the difficult rating per rig?